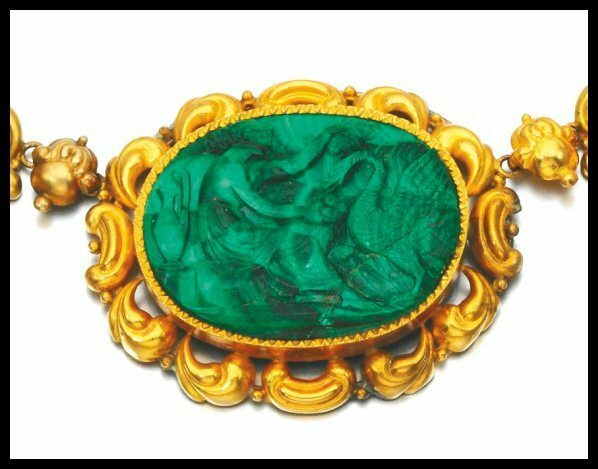 Antique gold and malachite cameo parure. 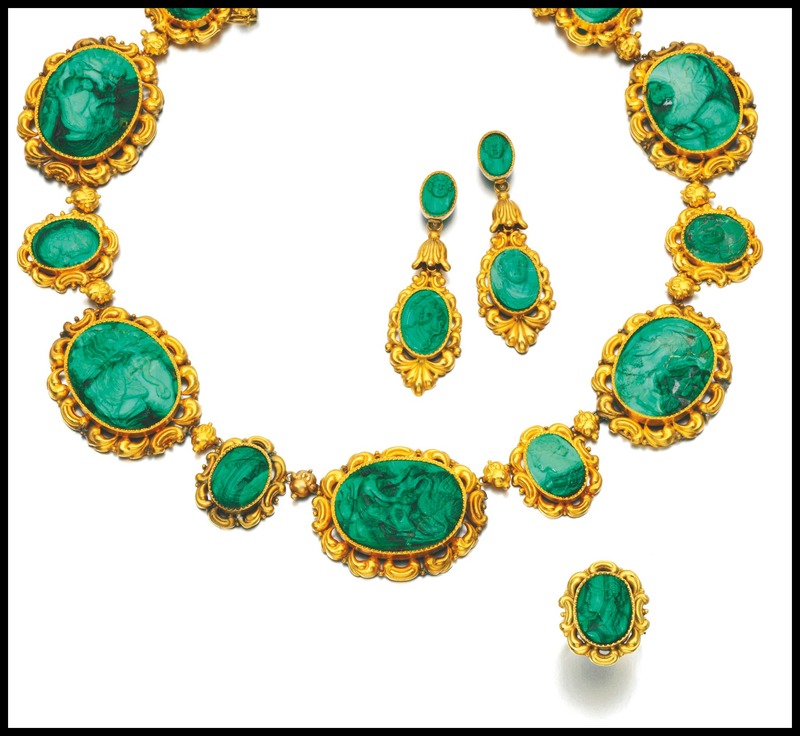 This antique gold and malachite parure is unreal. So right off the bat, the colors are incredible. The warm, buttery gold in its scrolling repoussé frames is a perfect foil to the rich, swirling green of the malachite. The necklace is just about 18 inches, which is precisely how long I was hoping it would be. A bold piece like this demands sufficient space. They’re all cameos!!! Each of the malachites is carved to depict a different classical scene. This one shows a woman with a swan (possibly Leda?). Here’s a look at the gold and malachite earrings. 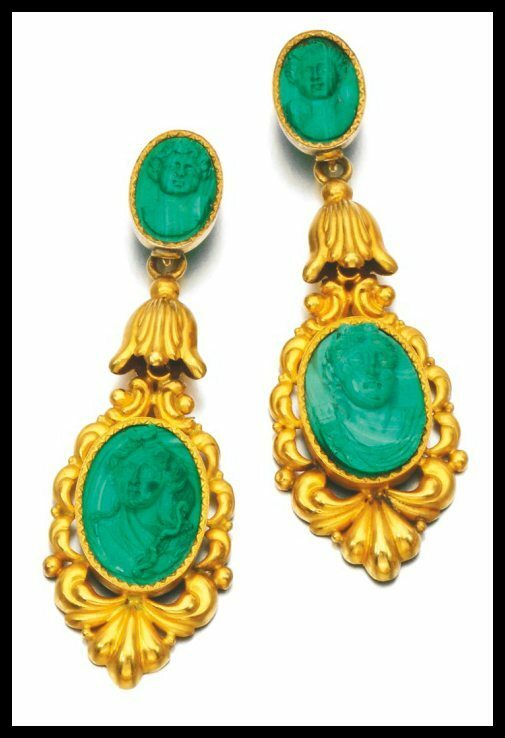 The malachite cameos of the earrings depict Diana and Atlanta, respectively. And here’s the gold and malachite ring. This malachite is carved to resemble a woman in the classical style, but she hasn’t been identified as any particular figure. The carving really is exquisite; look at the delicate tendrils of hair cascading down her neck. Here’s another detail of the necklace. It’s not easy to see the lines of the carving against the lines of the malachite in the photograph, but you can see some of it (especially if you’re looking for it). 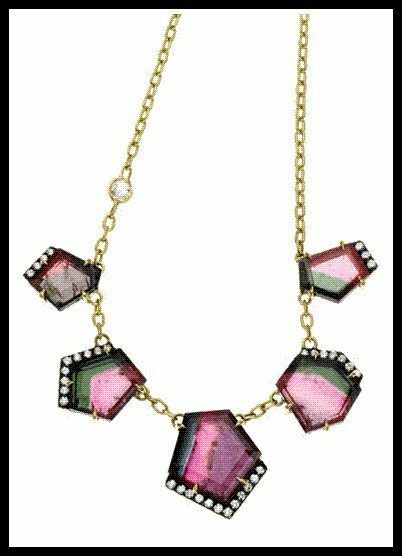 What do you think of this parure? I think it’s glorious, obviously. Sign me up! 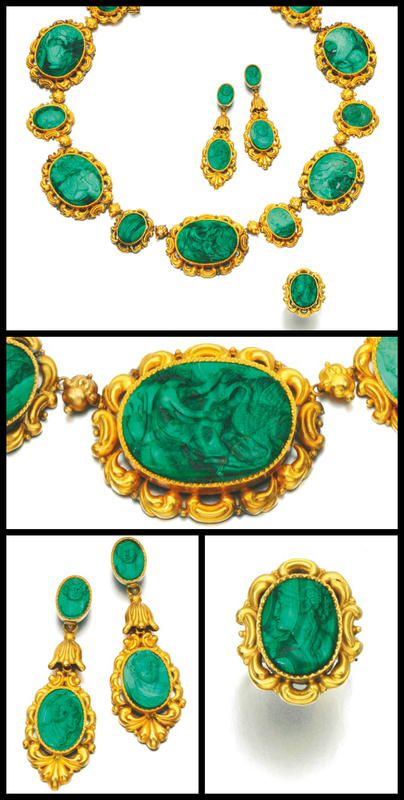 This antique gold and malachite parure was listed in a Sotheby’s auction. All images and info are thanks to Sotheby’s. Jewelry gift guide: $1,000 – $5,000. I’m going to let you in a secret: everything I love most from this year’s jewelry gift guides is in this post. Sadly, if had a spare $4,000 today I’d probably use it towards my student loans. Well, maybe $3,000 of student of loans and one of the pretties from yesterday. This is for those of you for deeper pockets, or those of you like me who love to admire and dream. To revisit the jewelry gift guide for another price range, please click here: under $50, $50–$100, $100 – $250, $250 – $500, $500 – $1,000. Antique Art Deco Chinoiserie glass bead bracelet with 14k gold ($2,9995). This bracelet is SO cool. Look at those details! I hope it finds a good home. My love for the things Jemma Wynne does with watermelon tourmaline knows no bounds, and these studs can show you why. Normally I do a decent job of admiring rather than coveting jewelry that I can’t afford, but I failed with this pendant. The classic VC&A design with warm yellow gold and the spectacular color and lines of malachite? I want it and I want it badly. Kara Ross Petra Smooth Contour Ring in Amethyst and Diamonds in 18K Gold ($4,500). This piece is so modern and and cool and interesting. 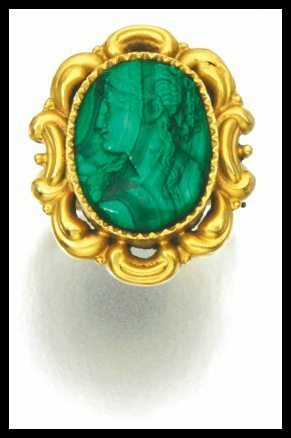 Amedeo Sardonyx, gold and diamond elephant cameo ring ($3,500). Gumuchian “The Ring Cycle” convertible bracelet/ring (starts at $4,400). I had the chance to play with some of these at the Mervis holiday trunk show over the weekend and I fell head over heels for them. 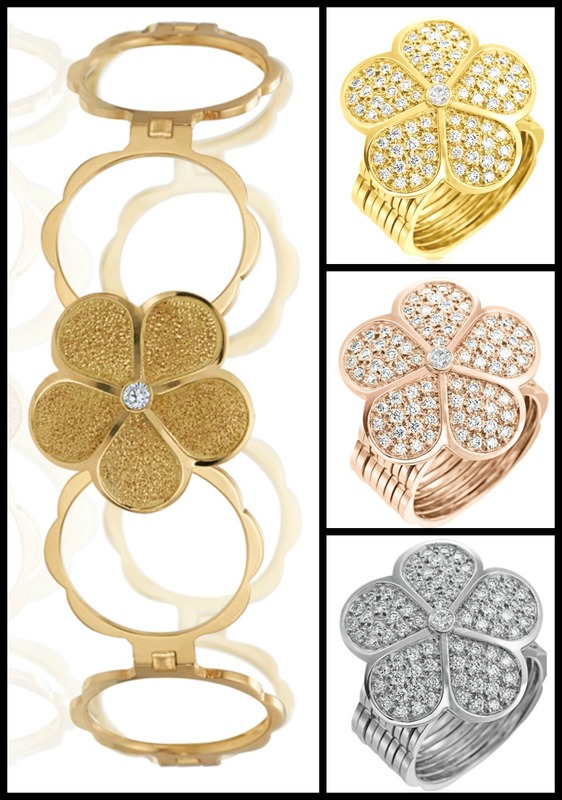 A lovely bracelet that folds up unto a chic ring? What more could a lady want? Kara Ross New York Deco Cage “Gemstone” Drop Earrings in Sterling Silver with Black Mother of Pearl and Black Sapphires ($2,250). If you’d like more gift ideas, please check out my past store profiles, my guide to camphor glass jewelry, and past Ebay and Etsy posts. As always when shopping online, please pay attention to shipping charges, read return policies, and make sure that any bling you buy is the right size. My jewelry sizing cheat sheet can help. Art Deco carved hardstone and diamond bracelet. I rearranged my posting schedule so that I could show you this bracelet sooner rather than later. It’s incredible. Circa 1925, this stunning Art Deco carved hardstone bracelet takes the form of an articulated band decorated with panels of hardstone flowers within a border of single cut diamonds. The hardstone panels are crafted from meticulously carved pieces of coral, carnelian, chalcedony, and malachite fitted together and set against a lapis lazuli background. Here’s the long view. How amazing are those Art Deco carved hardstone panels? They’re all different and a few of theme seem to continue behind the diamond frames (the final two at the bottom are a great example of this). The craftsmanship involved in creating something like this just blows my mind. This is a shot of the bracelet from the back, which gives a better sense of the precision involved in creating the hardstone panels. The reverse is rather beautiful in its own right, even if it won’t normally be seen. This Art Deco carved hardstone and diamond bracelet was listed in Sotheby’s December 2007 Magnificent Jewels sale. All images and info are thanks to Sotheby’s. Have you entered the my giveaway yet? I’m giving away a free pair of diamond earrings!